What Was the First Commercial Product to Have a Bar Code? On June 26, 1974, a pack of Wrigley’s Juicy Fruit chewing gum became the first commercial product to be scanned with a bar code. Barcodes are used to identify, price, and log commercial products. Today, almost every commercial product is attached with a barcode (or bar code). A barcode consists of a pattern of numbers and lines of different widths which are printed on a product/commodity. Barcodes help in controlling stock and pricing of the products. The codes are readable by computers and machines automating activities such as stock taking and uploading prices. Barcode is one form of technological advancement which is boosting many industrial activities and minimizing errors. The idea of barcode application was started a long time ago in the year 1932 by some students at the Harvard University School of Business Administration. The students began a project whereby, customers were told to select their desired merchandise from a set of cards in a catalog. Once they made the selection, the cards were punched and then passed over a reader for recording. The idea may appear somehow rough, but these students made progress towards barcode invention. The real idea of bar code reading was developed by Bernard Silver in 1948. Silver, who was a graduate of Drexel Institute of Technology, was inspired when he came across an idea from one of the presidents of a local food chain. Silver heard the president instructing one of the food chain’s deans to embark on research which would enable them to keep proper records of the inventory. Silver then informed Norman Joseph, who was his friend; and Woodland accepted the challenge. Joseph Woodland then began designing the project. At first, he used ink to draw lines on the commodity with varying width. The ink he was using could glow when ultraviolet light was passed over it. On October 20, 1949, Silver and Joseph applied for a patent for their project which they received on October 7, 1952. Initially, the codes used “bull’s eye” technology in which concentric lines of rings were drawn. The drawing was a cumbersome activity, and it involved drawing of four lines which were white on a dark/black background. The Barcodes made by Woodland and silver may have been ready for use earlier, but the first commercial application began in 1966. The National Association of Food Chains (NAFC) instructed manufacturers to put up systems which would speed check out processes. RCA then set up scanning equipment in its stores at Kroger in Cincinnati in the year 1967. NAFC then requested Logicon, Inc. in 1969 to develop a system of bar codes which would handle many industries. The firm was able to come up with part one, and two of the project in 1970 termed as the Universal Grocery Products Identification Code (UGPC). However, it was until June 26, 1974, that Wrigley’s Juicy Fruit chewing gum became the first commercial product to be scanned with a barcode. 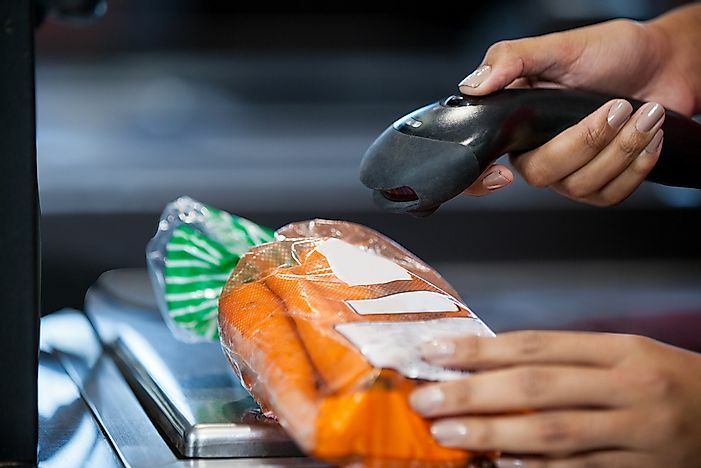 The purpose of 1D and 2D barcodes may not be efficient in handling the massive amounts of commodities in store. The image recognition technology will ease scanning since it can identify product image and the logo. Besides, QR codes will also boost barcode since customers can scan a commodity by using their mobile phones.